-	The eastern diamondback rattlesnake. 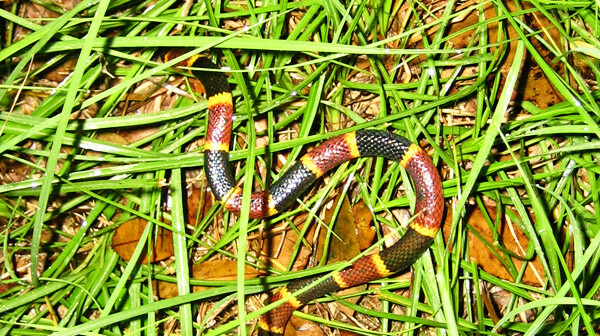 The Eastern coral snake is characterized by red, yellow and dark-brown strains of colours. The venom of this snake is neuro-toxic in nature, and can paralyze the nervous system instantly, causing the paralysis of the diaphragm. The Florida cotton mouth is also referred to as the Water Moccasin and it remains the most dangerous water snake in the entire state of Florida. The coloration of the body of this snake can vary from simple dull black to patterned. You can identify a Florida snake by the black eye line that runs straight from the side of their eyes down to the side of their head. The eye-line mark is a body trait you will find in both small and adult Florida snake. The Dusky Pygmy rattlesnake is a small poisonous snake that measures between 15 and 22 inches in length. This snake makes a small rattle sound that often sounds like insect buzzing. Children often become victims of this snake because they believe its small size makes it harmless and for this reason, kids must be educated about the dangers of playing with the animal. The Eastern Diamondback rattlesnake is the largest rattle snake in Florida and in the United States at large. The snake measures between 5 and 6 feet in length and its size makes it easier to be spotted, however, its dark brown colour as well as the fact that this snake often stay in one position in a coiled position, may make it pretty difficult to spot sometimes. This snake is dangerous because it can strike any animal or human from its coiled position and it can accurately strike at half of its length at an incredible speed. The best possible way to avoid this snake is to move away as quickly as possible from it. Fortunately, the Diamondback does not always strike unless you move very close to it. Venomous snakes in Florida have accounted for more than half of the total snake bites in Florida, considering the fact that the state is predominantly tropical in nature. Most Florida cities are located close to forests where many venomous snakes are naturally located and for this reason, snake bites are rampant, especially during the warm summer months. Go back to the How to get rid of snakes home page.